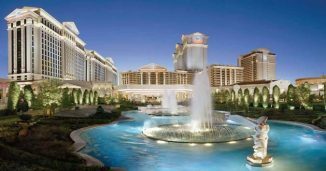 Caesars Palace is one of the world’s top resorts and casino, celebrating the glory that was Greece and the grandeur that was Rome, in an 85-acre destination location that sets the standard for entertainment, dining, and luxury. Located in the heart of the Las Vegas Strip, Caesars Palace ranks among the world’s top luxury resorts and features 3,340 hotel guest rooms and suites, 24 diverse restaurants and cafes, 4.5-acre pools and gardens, the 50,000 square foot Qua Baths & Spa and 240,000 square feet of premium meeting and convention space. Caesars Palace features 300,000 square feet of meeting space, set apart from the casino area. With an outstanding range of flexible venues with countless configuration options to suit any group, large or small, a meeting at Caesars Palace is a most successful event, each and every time. The 51,000-square-foot, pillarless Octavius and Forum Ballrooms can each accommodate as many as 5,555 guests and can be reconfigured into up to 25 separate breakout rooms. At 36,260 square feet, the Augustus Ballroom is a superb setting for the grandest affairs with countless configuration possibilities. The 28,592-square-foot Palace Ballroom features an expansive pre-function area, service hallways on three sides and direct access to freight elevators. The 4,100-seat Colosseum with one of the world’s largest LED screens, and the 4.5-acre Garden of the Gods Pool Oasis are just two of the many exciting special venues at Caesars Palace that can bring a unique twist to your meetings and events. The ultimate training conference on the ultimate marketing discipline: experiential marketing.